ROCKLAND COUNTY, New York (WABC) -- The Department of Health has announced additional measles cases linked to international travelers returning from Israel in Rockland County and in New York City. Rockland now has seven total confirmed cases of measles from three different groups who traveled to Israel. Of those cases, two are secondary, meaning they originated from exposure occurring in Rockland. Meanwhile, six cases of measles were confirmed this month in the Orthodox Jewish community in Williamsburg, Brooklyn. Officials say the initial case of measles was acquired by a child on a visit to Israel. The individuals with measles range in age from 11 months to 4 years, and five of the children were unvaccinated prior to exposure. One child was hospitalized with pneumonia, while another child had an ear infection. More cases increase the potential for further exposure, and health officials recommend that residents make sure they and their families are up-to-date on their measles vaccinations. Israel is currently experiencing a high number of measles cases. In the most recent data compiled by the World Health Organization (WHO), 339 cases have been reported in Israel from March through August of 2018. A measles, mumps, and rubella (MMR) vaccine clinic for those who are not immune to measles will be held on Thursday, October 18, from 4:30 p.m. to 6:30 p.m. at the Community Outreach Center located at 21 Remsen Avenue in Monsey. For those who believe they may have been exposed and have further questions, a toll-free hotline has been established: 1-888-364-4837. The hotline is available Monday through Friday from 9 a.m. to 5 p.m. The first case of international travel was in late September, and two more cases due to separate international travelers in early October are leading to more potential cases of measles among non-immune residents. ר' נחמן האט עס אויך געשריבן אויף טוויטער? א היימישער משולח פון ארה"ק איז אידענטיפיצירט געווארן אלס "פאציענט זערא" פון דעם מיזעלס אויסברוך אין מישיגען אינפעקטירנדיג לערך 40 מענטשן. 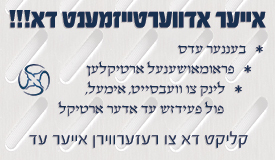 דער ערשטער וואס איז אנגעשטעקט געווארן דערפון אליינס אדער עס געברענגט פון א ניי פלאץ (א"י אין דעם פאל), און דאן עס געשיקט ווייטער פאר אנדערע וואס וואלטן עס אנדערשט נישט געהאט פון ווי צו קריגן. NEW YORK (REUTERS) - A Brooklyn judge on Thursday denied a petition seeking to lift New York City's recently-imposed mandatory measles vaccination order, dismissing a court challenge brought by an anonymous group of parents who argued the order was unconstitutional. The religious objection exemption contained in Public Health Law $2 164(a) applies only to the certificate of immunization required to admit a child to school, not to remedies attendant upon declaration of a public health emergency. Even if it did apply, the affidavits provided herein are insufficient to raise this issue. The affidavits merely state, in essence, that in the individual opinion of each of the affiants, taking the vaccine is violative of their religion. These opinions are entirely unsupported by an affidavit of a religious official (priest, rabbi, etc.) or other doctrinal documentation tending to support their opinion. קאמענטאטאר האט געשריבן: א היימישער משולח פון ארה"ק איז אידענטיפיצירט געווארן אלס "פאציענט זערא" פון דעם מיזעלס אויסברוך אין מישיגען אינפעקטירנדיג לערך 40 מענטשן. 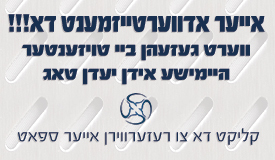 אויף די ראדיא נעכטן האבן זיי פארקויפט אז עס איז געקומען פון א וויליאמסבורגער האסידיק פערזאן.